Between 1845 and 1849 during the great famine period, over 1 million men, women and children died in Ireland from starvation, malnutrition, typhus, dysentery or cholera. This led to mass immigration to get out of the country, if at all possible, with many people going to Australia, the USA or Canada. In Victoria which, at that time, was still part of NSW there was a growing demand for skilled labour including agricultural or farm labourers and this was the reason that the bounty system was set up by the government to encourage skilled immigrants to Victoria. No doubt the influence of letters sent home to Ireland from existing Irish immigrants in Victoria encouraged family members and friends to follow them to Victoria where work was plentiful and there was the possibility of saving to purchase your own land. In Ireland at that time farmers rarely had the opportunity to own their land and it was leased. With the break-up of the squatters runs in Victoria small parcels of agricultural land became available. In the Belfast (Port Fairy) and Tower Hill areas of Victoria where there was plenty of rich volcanic soil, the break-up and sale of the run of James Atkinson (5120 acres) at Belfast (Port Fairy) and the William Rutledge (5120 acres) into smaller allotments resulted in many young Irishmen taking the opportunity to purchase land. Rutledge's special survey (Farnham Park) which he took out in 1841 was sold at 1 pound an acre when it was broken up. James, Patrick and John Lane all came to Victoria in the 1840's as young single Irishmen from Shravokee, which was a small Townland in County Clare, Ireland. This was when Victoria was still part of New South Wales. John was to marry Sarah Darcy but James and Patrick were to remain unmarried. Their brother Thomas Lane, who remained in Ireland had a son Michael lane who followed his uncles to Victoria in 1861 and became a very successful farmer. During the 1840's and 1850's other Lane families, as well as relatives such as the Moloney's, Gleeson's, Malone's and Madden's from the same area in County Clare, Ireland also arrived in Victoria attracted by similar farming conditions to Ireland and also by the discovery of gold in the colony. Michael Lane, b1788, of Shravokee, Clonlara, Co. Clare married Catherine Moloney and they had at least four children, James b1816, Patrick b1817, and John b1825, all of whom came to Australia and Thomas b1818, from whom we are descended, who stayed in Ireland. James Lane and Patrick Lane were the first known of our Lane family to arrive in Victoria. They arrived in Victoria on the "Neptune" on 29th March, 1841 which left Plymouth, England on the 12th December, 1840 and, according to the shipping records, they were 25 and 26 years of age respectively. Both could read and write and their occupations were listed as laborers. A bounty of £19 was paid to a Mr. John Marshall. Also on the ship were their cousins Jeremiah and Thomas Maloney. It should be noted that the mother of James Lane and Patrick Lane was Catherine Moloney. 1. James Lane died of exhaustion, a bachelor at the age of 76 years, on 21st April, 1887 at Koroit, Victoria. 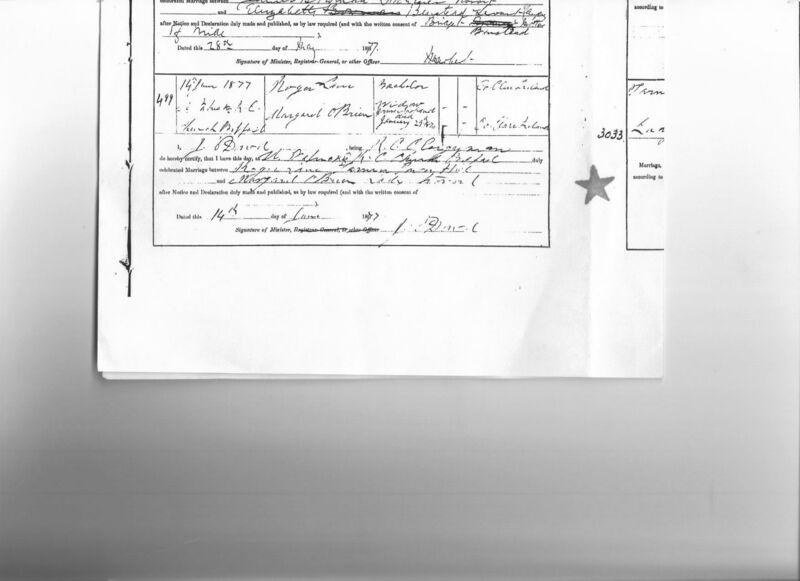 His Death Certificate of the same date lists his parents as Michael Lane, farmer and Catherine Lane, formerly Moloney. The informant of the death was Michael Lane, who indicated that James was his uncle, - (see below) and a witness at the burial, which was conducted at the Tower Hill Cemetery, near Koroit, was Roger Lane. A headstone at the Tower Hill cemetery carries the following inscription. Who died April 21st, 1887 aged 76 years. 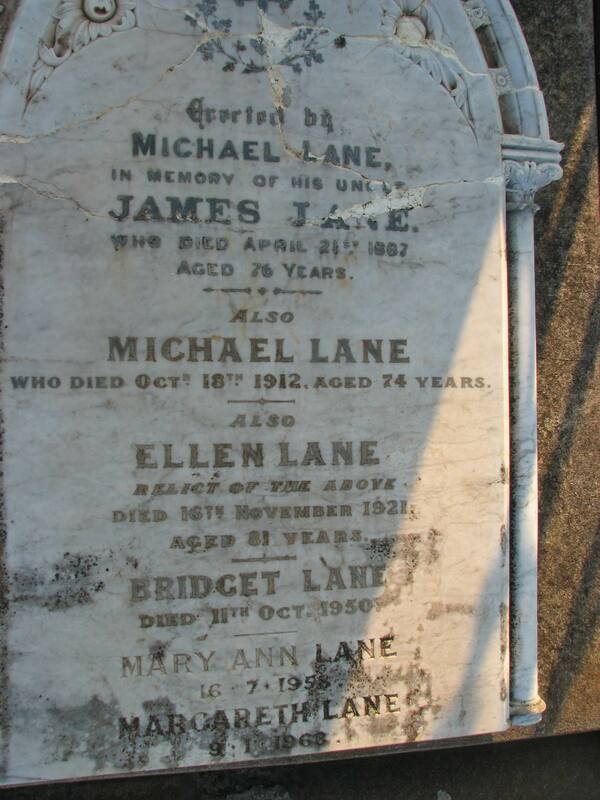 Also Michael Lane who died October 18th, 1912 aged 76 years. Also Ellen Lane, Relict of the above died 16th October 1921 aged 81 years. Bridget Lane Died 11th October 1950. Mary Ann Lane, Died 1958. 2. Patrick Lane's death certificate advises the following -:. Patrick Lane died on 1st October 1876, aged 65 years, unmarried. He had worked as a laborer. His parents were given as Michael Lane and Catherine Moloney of County Clare, Ireland. Patrick died suddenly - caused by congestion of the lungs, heart, stomach and intestines accelerated by drink and excitement. He died in Birregurra, a small farming community about 80 miles from Warrnambool and is buried at Irrewarra Cemetery. The informants at his death were Michael McGrath and Martin Duck. An inquest was held on Patricks death and his brother John Lane gave evidence. 3. John Lane b1825, County Clare, Ireland, married Sarah Darcy, who was aged 18 and also born in Co. Clare, at Warrnambool on 5th October, 1853. He listed his age as 28 and his parents as Michael Lane, farmer and Catherine Maloney. Sarahs parents were shown as Anthony Darcy and Annoria Leary. John and Sarah apparently settled in Sandhurst prior to 1854 where they spent at least 7 years and later settled at Birregurra. Gold was found at Sandhurst in late 1851. In 1891 the town of Sandhurst became known as Bendigo. Sarah is listed in the pioneer index as having died in 1870. 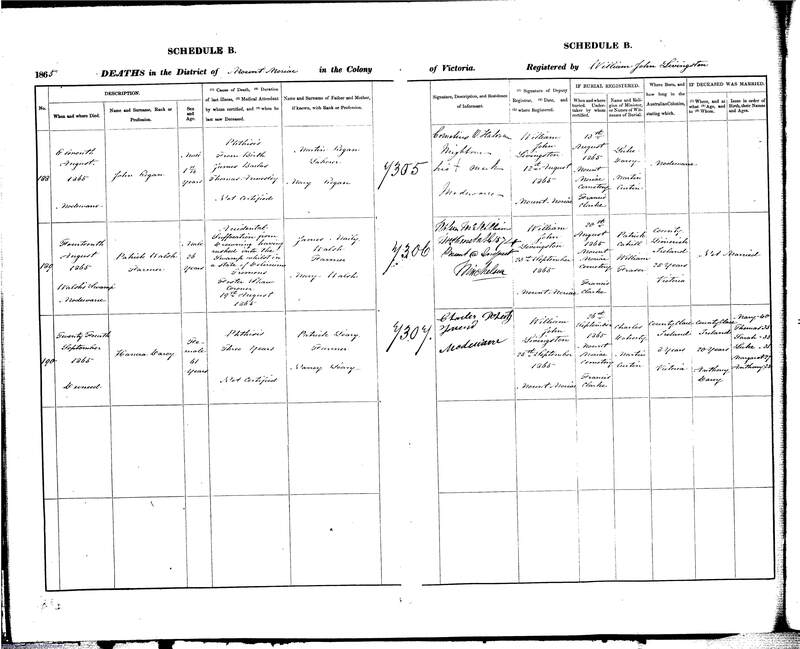 The index shows she was 38 years of age, born Co. Clare and her parents are shown as Anthony and Honoria Darcy. Her date of death conflicts with the birth of her son James Lane in 1871. John died on August 13th, 1898, at Birregurra. His age was given as 90 however he must have been 73 years of age. His mothers surname was incorrectly given as Gorman by the informant C. J. Barry who was present in the house when he died. The certificate states that his occupation was a laborer and he had spent 47 years in the Australian Colonies mostly in Victoria. He is buried at the Irrewarra Cemetery. His children were listed as Michael (dead), Thomas 43 yrs, Luke (dead), John 36 yrs, Anthony 34 yrs and Patrick 32 years. Anthony did not appear on his mothers death certificate and cannot be traced in the birth indexes. Death has removed another old and respected resident ot the district in the person of Mr. John Lane, which took place at his residence, Birregurra, on Saturday morning last, the cause of death being pleurisy. He has been a resident of the district for more than 30 years and in the colony for 60 years. The deceased who had reached the grand old age of 90 years leaves a family of 4 sons, 3 of whom reside in NSW and 1 in Camperdown. His remains were interred at Warncoort cemetery on Sunday, a large number of vehicles and horsemen following the cortège to the last resting place. John and Sarah Lane had six children. Breaches of the Education Act. This was presumably for non attendance at school. 4. Roger Lane another early arrival was the son of Thomas Lane and Ellen Maloney and was born in County Clare, Ireland in 1847. He arrived in Victoria in the 1860s and married on June 14th,1877, at Port Fairy, a widow Margaret OBrien, age 27, born Co. Clare. Her maiden name was Margaret ODonnell. Witnesses at the wedding were John Moloney and Mary O'Donnell. 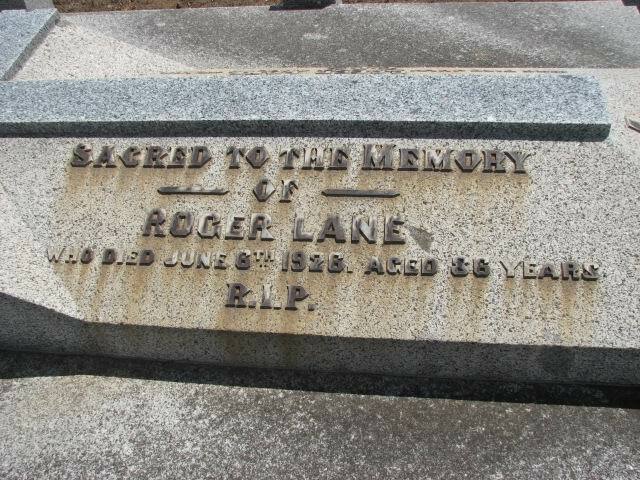 Roger Lane died on June 6th, 1926 at Koroit and left no children. The informant of his death was Thomas Lane, farmer of Tower Hill. However, he did have a brother John Lane who was a farmer at Clonlara, Co. Clare, Ireland, at the time of his death in 1926. Roger Lane is buried at Tower Hill Cemetery. Gravestone of Roger Lane. 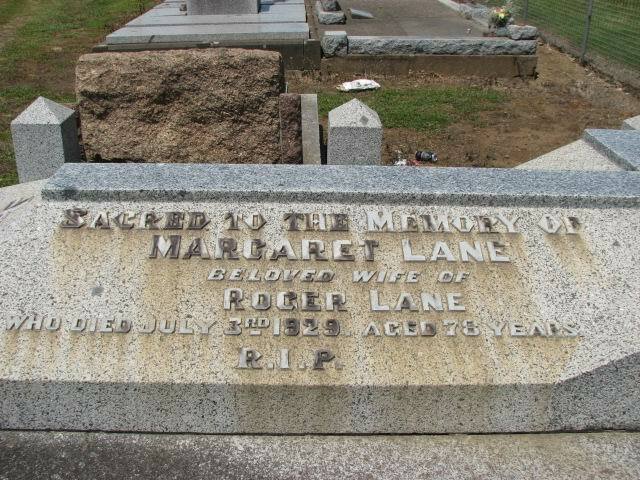 His wife Margaret Lane died 3rd July, 1929. Gravestone of Margaret Lane. In his Will he left many donations to various charities but the bulk of his estate was left to his wife, Margaret Lane, nee O'Donnell, and then on her death to be divided between his brother John Lane in Ireland and his niece Ellen Gorman in Victoria. Ellen was daughter of Thomas Lane & Margaret Lane of Crossley. Roger's obituary stated that Margaret Lane was a sister. "A very old resident of Koroit in the person of Mr. Roger Lane died at his residence on June 6th, 1926. The late Mr. Lane was born at Shravokee, County Clare, Ireland and landed in Melbourne 66 years ago then being 21 years of age. After spending a short time in Melbourne, he came to this district where he has resided unbrokenly until the time of his death. He successfully engaged in farming pursuits being thrifty and hard working and acquired a small farm close to Koroit. He was married in Warrnambool some years after coming to the district and his wife survives him. Two or three of his brothers and one sister went to America. His brother Michael died at Koroit many years ago. The late Mrs. Thos. Lane of Crossley was a sister. The funeral took place on Wednesday morning and was largely attended. Many members of the Hibernian Society (of which he was a member) attended in regalia. Roger Lane had a brother, James T. Lane who went to New York in the USA and became very successful. He was a Colonel during that country's Civil War and also a newspaper editor.. His obituary was reported in the Koroit Sentinel on June 27th, 1908. 5. Thomas Lane was another early arrival. He was the eldest son of John Lane and Mary Hogan, of Firhill, Co. Limerick. He married Margaret Lane, daughter of Thomas Lane and Ellen Maloney, of Co. Clare, on 14th July, 1867 at St. Joseph's Church, Warrnambool, Victoria. He was 34 years old and a farmer from Tower Hill and she was 21 years old and a farmer's daughter. Witnesses at the wedding were a Michael Lane and Mary Anne Lane. Thomas, died age 80, according to his death certificate, at Killarney, but according to his obituary he was 74. An old and respected colonist died at his residence, Crossley, on the 13th inst., in the person of Mr. Thomas Lane, who arrived in Victoria about 54 years ago. He was identified with the early days of the gold diggings and 35 years ago he purchased land at Crossley, where he was engaged in farming until the time of his death, which occurred at the age of 74 years. He leaves a widow and grown up family to mourn their loss. The late Mr. Lane was the eldest son of Mr. John Lane of Firhill, Co. Limerick, Ireland and was very highly respected throughout the district. The funeral took place last Saturday, when considerably over 100 vehicles followed the remains to their last resting place, the procession being about a mile and a half in length. The Rev. P. Lennon conducted the service at the grave. Note-: It is believed the reference to John Lane of Firhill, County Limerick, should read Firhill, County Clare which is just over the border. We know from his marriage certificate Thomas Lane was 34 years old in 1867 and therefore was born c1833. We also know from his obituary that he was 74 years old when he died in 1905 which more or less confirms he was born c1833. His death certificate stated he was age 80 when he died. From his obituary he was 54 years in Victoria which makes his arrival c1851. Per her Death Certificate, Margaret Lane died on 10th June 1921, aged 75 years at the residence of her daughter, Mrs. Coleman Gorman, Crossley. (See Roger Lane's Will of 1926). The informant was her son Thomas Lane of Illowa, Victoria who stated that her parents were Thomas Lane and Mary Moloney and that his mother had lived 55 years in Victoria. (Ellen and Mary would be the same person  Mary Ellen a common name in Ireland at this time). This would make Margaret a sister to Thomas Lane b1833 and Roger Lane b1840 (see above). Link to Thomas Lane's father John Lane of Firhill, County Clare, Ireland. 6. Thomas Lane who was born approximately 1833 at Shravokee, County Clare, Ireland, was another early arrival in Victoria, arriving about 1854 when he was about 21 years old. He married Catherine O'Shannessy at Warrnambool on 4th January, 1868. She was the youngest daughter of Daniel and Judith OShannessy of Shravokee, County Clare, Ireland. She had three brothers James, John and Daniel. 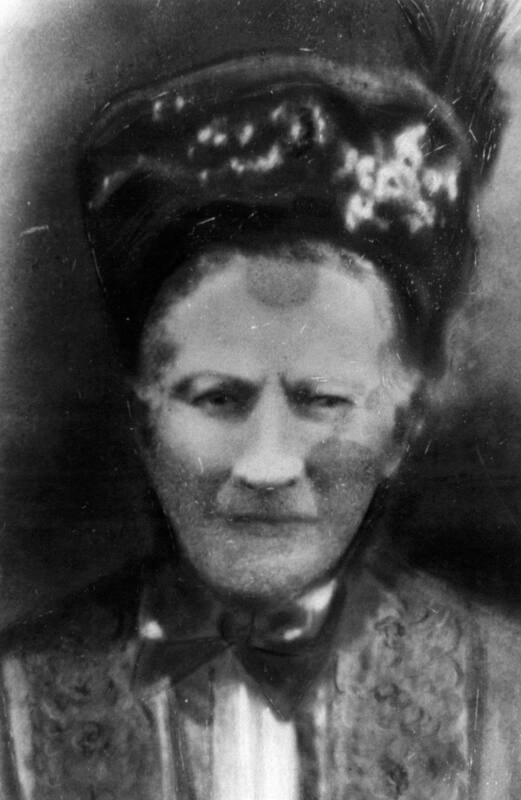 She arrived in Australia in 1852 aged 18. Roger Lane (see above) was a witness at the marriage. Thomass marriage certificate of 4th Jan 1868, which he signed, said he was a farmer, aged 35, born in County Clare and stated that his parents were Thomas Lane, farmer, and Ellen Moloney. Thomas Lane farmed at Hopkins River, Warrnambool, and later purchased land at the "Survey" on the 27th July, 1876 and went to live there on 2nd May, 1878. This was part of the large William Rutledge estate that was subdivided on Rutledges death in 1876. William Rutledge & Farnham Park. William Rutledge was an Irish born prominent Sydney businessman, who with 4 partners, was in 1843 granted 5120 acres (2972 ha.) under the The Special Survey System which was offered by the Colonial Office and which permitted capitalists to purchase 5120 acres at a cost of £1 per acre in any part of NSW of which the Port Phillip District (Victoria) then formed part of. He subsequently bought out his 4 partners. He named his Special Survey, which was near Koroit , " Farnham" and established a tenant community. Many of his tenant farmers were poor families he brought out from Ireland, at his own expense, which at that time was in famine conditions. He was said to have an explosive temper but was considered a kind and considerate landlord furnishing his tenants with rations, seed and farming implements. William Rutledge died in 1876 aged 70 and the Survey was divided between his 2 sons. In July 1876 the first subdivision of the estate took place and 1300 acres of the western portion of the Survey, from Gorman's Lane at Tower Hill to Survey Lane at the Belfast end of the Survey were subdivided and auctioned. The size of the blocks ranged from 3 acres to 70 acres. On July 29th, 1876 a further 729 acres were sold at prices ranging from £37 to £60 per acre. An additional 800 acres were sold in May, 1878. Among the 46 buyers of land in 1876 were Thomas Lane, John Malone, John Moloney, John Quirk, T. Roche, J.J. Madden, G. Gorman. Thomas Roche and T. Gleeson. Thomas Lane died August 27th, 1900 at the "Survey", Killarney aged 67 years. He also is buried at Tower Hill cemetery. 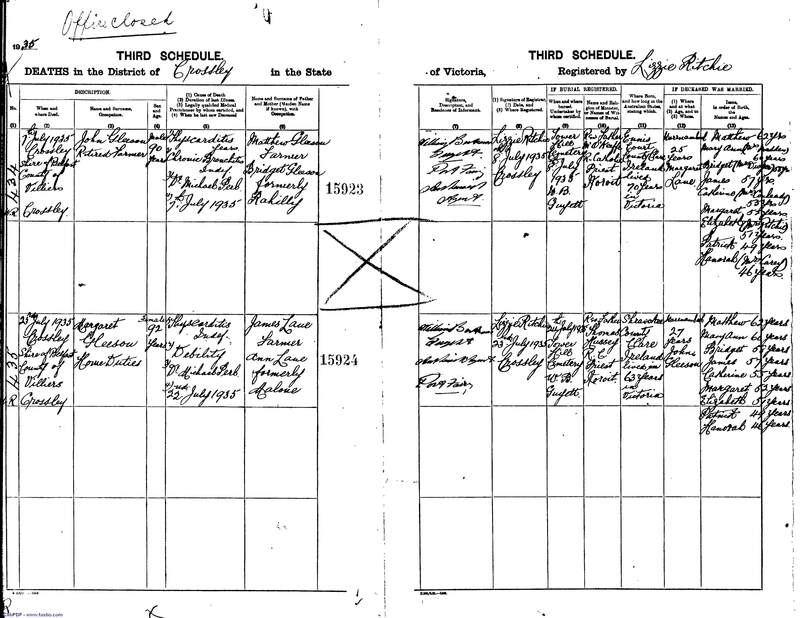 His Death Certificate 27th August 1900 again states that his parents were Thomas Lane and Ellen Maloney. His son, Thomas, provided these details. Gravestone Of Thomas & Catherine Lane. According to his obituary, " There died at The Survey, Killarney, yesterday morning an old resident in the person of Mr. Thomas Lane. Deceased was a native of County Clare, arriving in Victoria in 1854, when he went to the gold diggings with varying fortune. He was afterwards farming for some 13 years in the Warrnambool district and settled at Killarney where he followed the occupation of a farmer for the last 22 years. He was a colonist of 46 years standing and was 67 years of age at the time of death, and leaves a widow and two sons. 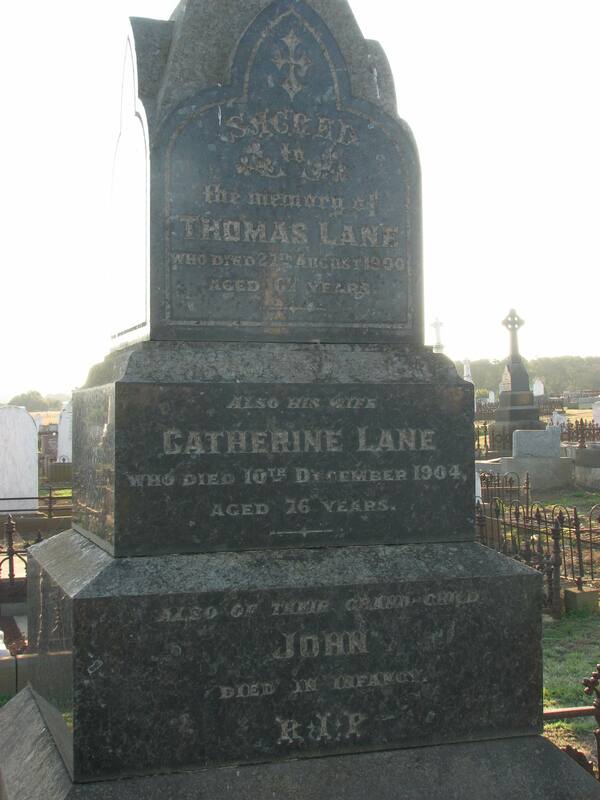 Catherine Lane died 10th December, 1904 and is buried at Tower Hill cemetery. Their daughter Mary [May] married John Joseph Wilkinson who was Mayor of Koroit in 1940, 1941, 1948, 1949, 1962 and 1963. John Wilkinson was to purchase later, one of Michael Lane's Farms. 7. Mary Ann Lane b1843 and Margaret Lane b1848 were also early arrivals from County Clare to the Colony of Victoria. They were in their early 20's when they arrived apparently unaccompanied. There appears to be no record as to what ship they arrived on. They were the daughters of James Lane and Ann Malone of Shravokee, County Clare and married two Gleeson brothers also from County Clare, whose parents were Matthew Gleeson and Bridget Rahilly. Mary Ann Lane, who was living at Woodford, married Thomas Gleeson, a farmer of Yangery, on 16th August, 1866 when she was 23 years of age. Witnesses at the wedding were James Moloney and Margaret Lane. She was to die at the young age of 35 and is buried at Tower Hill. 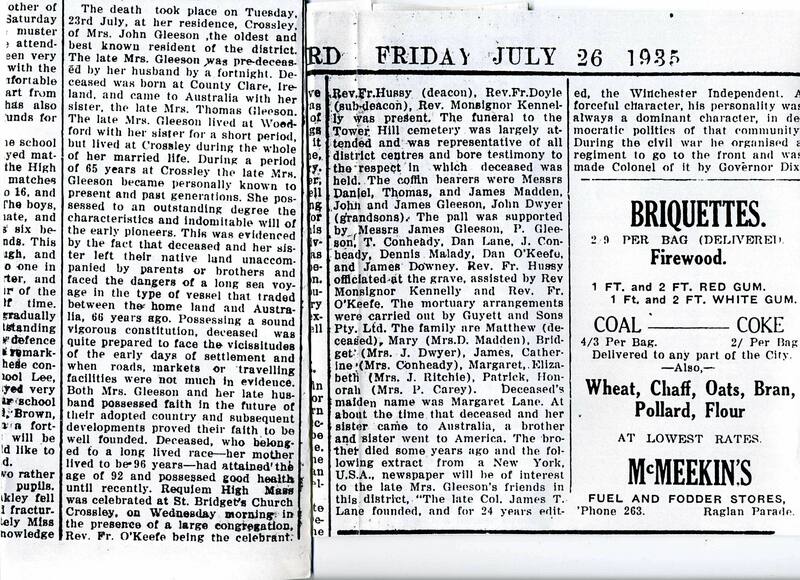 Thomas Gleeson and Mary Ann Lane had 3 children. Margaret Lane who was also living at Woodford, married John Gleeson, a farmer of Tower Hill, on 25th June, 1873 when she was 25 years of age. Margaret died age 92 on 23rd July, 1935 not long after her husband John Gleeson age 90 who died on 7th July, 1935. Her death Certificate states she was born at Shravokee, County Clare. 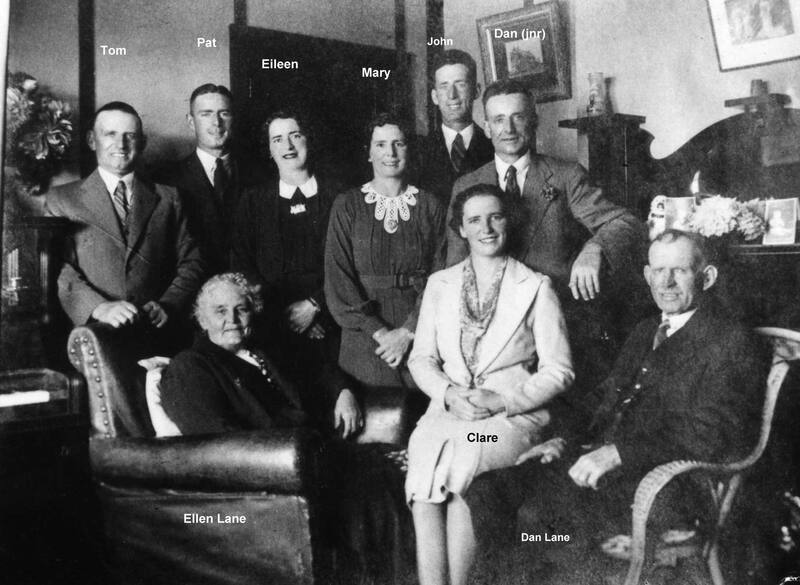 John Gleeson and Margaret Lane had 9 children. Margaret Gleeson's Obituary in the Warrnambool Standard stated she had a brother and sister who went to the USA. 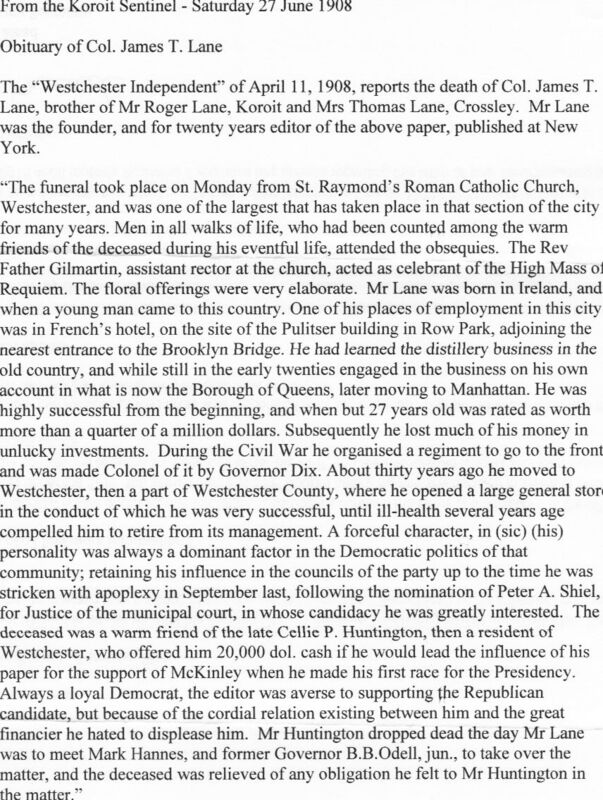 The obituary makes reference to Colonel James T Lane of New York being a brother but this is unlikely as he was a brother of Roger Lane and his sister who was also called Margaret Lane. The following gives some idea of the relationships between the various Lanes. James Lane (1) was the uncle of Michael Lane (5)- refer cemetery headstone and death certificate. James (1), Patrick (2) and John Lane (3) were brothers. The obituary of Roger Lane referred to a brother Michael who died at Koroit some years ago. Thomas (6), Roger(4) and Margaret (7) are brothers and sisters. Michael Lane (6) may have left a legacy to the sons of his brother, Thomas Lane (6) - refer will of Michael Lane. Margaret Lane (7) sister of Roger Lane married Thomas Lane (8).